Do you live near Baltimore and find yourself in need of a new mattress? The search for the perfect mattress can be overwhelming. That’s why we’ve put together this guide to help you find the best mattress you can afford. Are you overdue for a new mattress? A sagging or lopsided mattress in an obvious indicator. Less obvious? You’re feeling uncomfortable, unrested, or stressed during your day. A small study from the Better Sleep Council found that switching to a new mattress resulted in more restful sleep, lower stress, and back pain relief. In addition to the expense of a new mattress, however, finding the best place to buy a mattress can be a significant hassle, and one of the reasons that most Americans replace theirs every 10 years, rather than every 8 (as experts recommend). That’s why we’ve simplified the process by compiling a list of the best places to buy a mattress in Baltimore. Our guide is based on reviews by actual customers, and broken down by geographic region. Read on to find the best mattress store in your neighborhood, and make your mattress upgrade a smooth and convenient experience. While the majority of mattress stores in Baltimore focus on value and/or selection, Arhaus (660 S Exeter St) is all about luxury. This high-end furniture store also stocks a selection of top-shelf mattresses, with a focus on plush and euro-top mattresses, as well as box springs, beds, pillows and linens. Sleep Number, (8200 Perry Hall Rd) on the other hand, has a wider selection and offers mattresses for all price points. This national chain is known for offering personalized sleep consultations to each customer, assigning shoppers mattress-matching “sleep numbers” based on body type, sleep position, comfort preference and conditions such as snoring or back pain. Finally, shoppers looking for a locally-owned furniture and mattress store can check out MiYHome (1605 Eastern Ave), which boasts a five-star Yelp rating. The owners of this stylish store are passionately committed to both the furniture business and the Baltimore community, and their mattress selection, while small, reflects a commitment to high quality. Sleeptime Bedding & Mattresses (303 Reisterstown Rd) has earned an incredible 5-star review average based on no less than 69 perfect-score reviews. Customers rave about this mattress store’s competitive pricing, service and professionalism. Another option for those seeking an affordable mattress is Mattress By Appointment (6417 Harford Rd). As the name suggests, this store has no regular hours, and customers who wish to browse will need to schedule a visit. By reducing their overhead and eliminating staff, Mattress by Appointment manages a drastically reduced overhead, which is passed on to the consumer in the form of serious discounts- 50% to 80% off retail on brands like Serta, Beautyrest, Sealy, Simmons. Veterans save an additional 5% as well, and customers have awarded this locally-owned and –operated mattress store a perfect five-star online rating. Still another place to buy a mattress in North Baltimore is JMD Furniture and Mattress (7100 Darlington Dr), which sells highly affordable mattresses and furniture. Mattress brands in stock include Sealy Posturepedic, Serta, and Sterns and Foster, and many come with a free box spring. Many are closeout, overstock or discontinued models, and are available at savings of 50%. JMD Furniture and Mattress guarantees their low prices, and promises to meet any competitor’s price on the same product. Those looking for a mattress as well as furniture- especially those on a budget- should visit Baltimore Discount Furniture (717 N Hammonds Ferry Rd). Here, shoppers will find a wide selection of home furnishings, as well as Latex, Linked Coil, Foam, Memory Foam and Gel Foam mattresses, along with Adjustable Bases, Headboards, Linens, and Bedding. 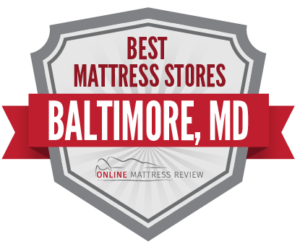 There are no less than three Mattress Firm locations in South Baltimore: Mattress Firm Riverside (869 E Fort Ave), Mattress Firm Fells Point (1625 Fleet St), and Mattress Firm Halethorpe (3531 Washington Blvd). Mattress Firm is the nation’s leading mattress retail chain, and is famous for its highly-trained team of “sleep experts”, who patiently consult with customers to determine the best mattress for them based on their individual body type and comfort preferences. The chain has over 3,000 locations nationwide and a 30-year track record. Mattress Firm stocks 55 different models from such leading mattress brands as Beautyrest, Serta, Simmons, and The Dream Bed. The highest-rated place to buy a mattress in East Baltimore is Mattress Firm Canton (3757 Boston St), which has earned an impressive 4.9-star Google average based on no less than 79 reviews. Customers here praise the store’s outstanding customer service, with staff showing patience and expertise, and never exerting sales pressure. Another, locally-owned option in the area is Magic Mattress (3312 Eastern Ave) a small and longstanding mom-and-pop mattress shop, an, just blocks away, Good Mattress and Furniture (3501 Eastern Ave). As the name implies, Good Mattress and Furniture is a good place to buy both furniture and mattress. Customers here give positive reviews to the reasonable pricing on both mattresses and delivery. Local mattress shops, Mattress Store Bed to Go (304 N Smallwood St) and Mia’s Mattress Warehouse (2034 Lord Baltimore Dr) have both earned positive reviews from customers for friendly and professional customer service, and for fast mattress delivery. The Mattress Connection (6567 Baltimore National Pike), another locally-owned option, has a five-star average Google review, and has a wide selection of both high-quality and more affordable mattresses, with brands like King Koil, Sealy, Sterns and Foster, Therapedic, and Crown Jewel Mattresses. The store also supports a wide range of local and national charities, and offers free mattress delivery and set up, as well as free removal and donation of buyers’ old mattresses. Finally, Baltimore Furniture Direct (2021 Lord Baltimore Dr) runs a bare-bones, warehouse-style furniture and mattress store, where the low overhead allows them to sell highly affordable mattresses, priced at 30% to 70% off retail. Their selection includes adjustable beds, gel, latex, “green” mattresses made with organic components, memory foam, and inner-spring sleep systems.